As absurd as it may sound, a comparison of the Lewis Hollow Site on Overlook Mountain in upstate New York and the temple complex of Ankor Wat in the jungles of Cambodia reveal some remarkable parallels. These parallels illustrate how a similar, sophisticated “worldview” may have indeed been just that; a universal belief system and practice, shared by ancient cultures around the world and across the globe. Do we see evidence of this in the unlikely commonalities found between these two sites? 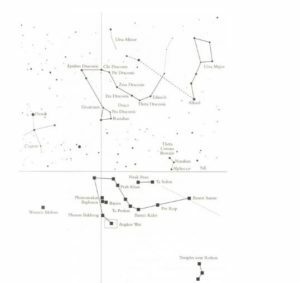 It has always been a confounding mystery to me how both the stone constructions at the Lewis Hollow site on Overlook Mountain and the Ankor Wat stone temples in the jungles of Cambodia both seem to mirror the northern circumpolar constellation Draco. This was shown to be true in my research on the Lewis Hollow site in Spirits in Stone and in Graham Hancock’s book Heavens Mirror. 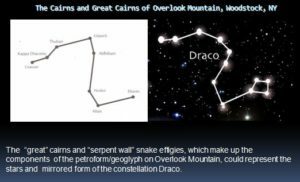 That connection was of course quite unexpected, as was the discovery of the Draco petroform on Overlook Mountain, in the first place. It wasn’t until very recently that I began to realize the connection did not end there. In the work of David Johnson at the Lewis Hollow site, it was shown through his dowsing surveys of the subsurface groundwater flow, that the stone constructions on the surface, the cairns, “great” cairns and serpent effigy walls were also marking and mapping the subsurface water features, where the ground water flowed more easily through the fractured bedrock to feed springs below. Those year round springs, along with the intermittent surface flow of rainwater in the steep hollow, feed small local brooks and streams that flow into larger creeks and rivers. But perhaps more was going on than just mapping the locations of the important headwater sources. Maybe there was more intention and purpose involved. Recent studies have revealed how the ancient Kumar culture in Cambodia used ground water to both sure up the foundations of their massive temples and provide irrigation for their agriculture. They built large moats around the perimeter of their temples which would fill in the rainy season and slowly drain into the surrounding ground to help solidify the sandy soil beneath the temples and create cement-like foundations to prevent the structures from crumbling. Also, while these moats were slowly draining, during the dry season, their stored water was diverted into distribution canals to flood nearby fields to grow rice, which requires two inches of standing water. At the Lewis Hollow site we also see how understanding and controlling the groundwater was part of the plan, but why? Is it possible there was a ceremonial and perhaps agricultural component to the manipulation of the landscape to map the subsurface hydrologic features in Lewis Hollow? It’s interesting to note the location of the Zena cornfields, a known Native American agricultural site in very close proximity to Lewis Hollow. In fact, if you draw a straight line along the axis of the hollow, out of the mountain, it leads directly from Lewis Hollow to the Zena corn fields located directly below the hollow, on the landscape. As water likes to follow the path of least resistance, it’s reasonable to see how the ground and surface water gathered and collected up in the Lewis Hollow springs and streams would seep and flow downward and end up feeding the Sawkill River, which runs parallel to the Zena cornfield to the west, or recharging the aquifer beneath the ancient cornfield on the valley floor. As the two old spring houses located up in Lewis Hollow attest, people have always sought to utilize the waters coming off Overlook Mountain into Lewis Hollow. Remnants of old homeade piping systems still exist, leading from those spring houses, transporting water to properties located in the lower parts of the hollow. Could the ancient Native American population of the area have wanted to help direct that water to their agricultural endeavors in the fields further below? Could the field itself have been located on the valley floor directly beneath the mouth of hollow in the mountain, where the water was concentrated and gathered? These are questions worth asking and understanding. Now, I’m not saying ancient Cambodians visited North America. The Ankor Wat temples date from about 1000 years ago, and some of the Catskill Mountain cairn complexes are speculated to be at least 3000 years old, and obviously more primitive expressions than the Kumar temples. Given that, when applying the concepts of cultural diffusion and early transoceanic peopling of the continents, over great time and distance, who’s to say, and one might wonder who influenced who? Nevertheless, by identifying the similarities between the Lewis Hollow and Ankor Wat sites, we can ask if the ancient Kumar and the ancient Native Americans shared a similar three dimensional world view, where sacred water (from the underworld) linked with their stone constructions on the earth’s surface, (the world of the living), and which in turn relate to the celestial or supernatural world above and specifically in this instance, the constellation Draco in the night sky? One must believe there’s more to the story than mere coincidence; a representation that may reflect an ancient global view of our human place in the Universe. 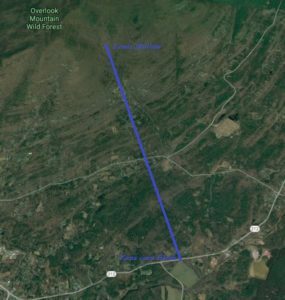 Is there a relationship between the location of the Native American corn field in Zena and the water source in Lewis Hollow on Overlook Mountain?